A new form of calculus has been invented by the authors of the the IPCC's Fourth Assessment Report (AR4), in order to create the false impression that global warming is accelerating. Is the slope of the graph greatest at the left hand end of the graph, or the right hand end? This clearly shows how the slope of the graph is in fact increasing. The graph is Figure 1 from FAQ 3.1, to be found on page 253 of the WG1 report. The slope over the last 25 years is significantly greater than that of the last 50 years, which in turn is greater than the slope over 100 years. This 'proves' that global warming is accelerating. This grossly misleading calculation does not just appear in chapter 3 of WG1. It also appears in the Summary for Policymakers (SPM): "The linear warming trend over the last 50 years is nearly twice that for the last 100 years". Thus, policymakers who just look at the numbers and don't stop to think about the different timescales, will be misled into thinking that global warming is accelerating. Of course, we could equally well start near the left hand end of the graph and obtain the opposite conclusion! (Just in case this is not obvious, see here, here, here or here for examples). A similar grossly misleading comparison appears at the very beginning of chapter 3, page 237: "The rate of warming over the last 50 years is almost double that over the last 100 years (0.13°C ± 0.03°C vs. 0.07°C ± 0.02°C per decade)." 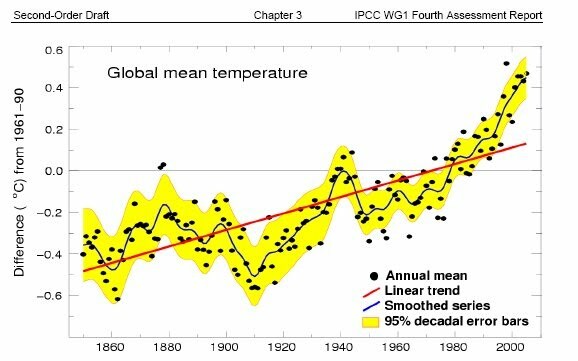 The trick appears again on page 249, "A HadCRUT3 linear trend over the 1906 to 2005 period yields a warming of 0.74°C ± 0.18°C, but this rate almost doubles for the last 50 years." How did this get through the IPCC's review process? Note that in this version there is only one trend line drawn. So why was this graph replaced by the grossly misleading one? Did any of the reviewers suggest that a new version should be drawn with a sequence of straight lines over different time intervals? No. One reviewer made the following remark: 'This whole diagram is spurious. There is no justification to draw a "linear trend" through such an irregular record',... but his comment was rejected. It is the same story with the misleading comment in the SPM mentioned above ("The linear warming trend over the last 50 years is nearly twice that for the last 100 years"). This statement was not in the original version reviewed by the scientists. It was inserted into the final draft that was only commented on by Governments. The Chinese Government suggested deleting this, pointing out that 'These two linear rates should not compare with each other because the time scales are not the same'. Well done to the Chinese Government for spotting that. Too bad their valid comment was ignored by the IPCC. 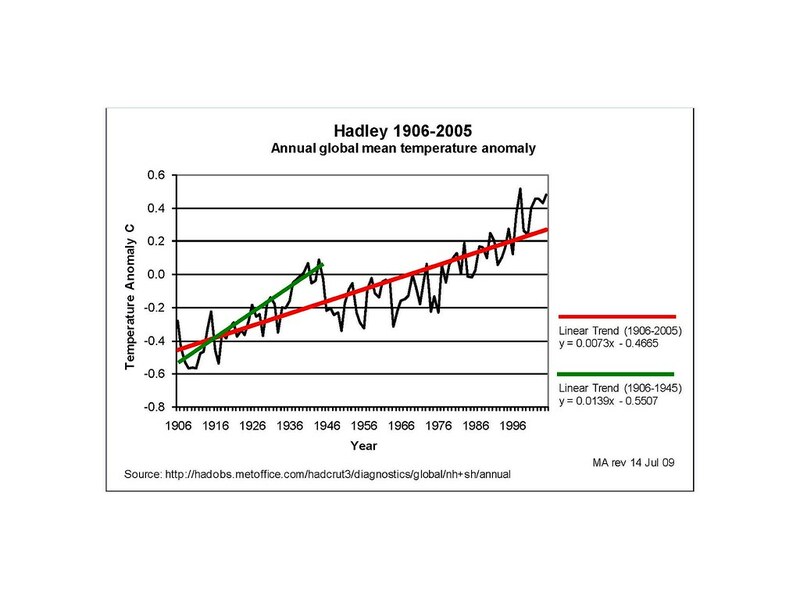 In the climategate 2 emails there is an interesting discussion between Jones, Trenberth and Brian Hoskins that sheds light on the origins of this graph, see email 2432.txt. 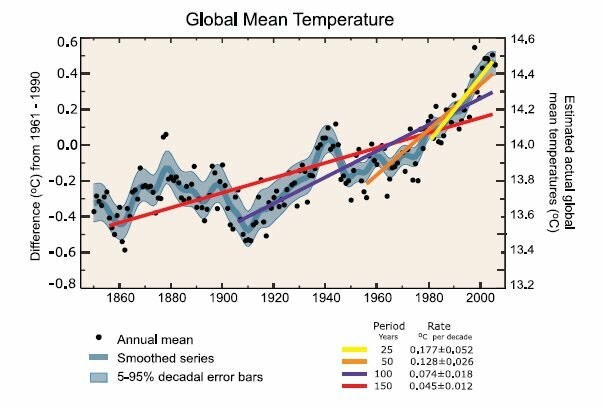 Hoskins says: "However I certainly defend the use of the 25, 50,100, 150 year trend lines on the temperature curve as in the TS and Chapter 3 as being better than the alternatives. A linear fit may not be a good one but when one is trying to make the smallest number of assumptions it is more defensible than for example putting in seemingly arbitrary break-points... The monotonically increasing slopes as one moves from the longer to the shorter time-scales is a strong indication of acceleration."